BADFEST is the social event held for the annual conference of the British Association of Dermatologists. This year’s 2018 conference was hosted at the Edinburgh International Conference Centre (EICC). 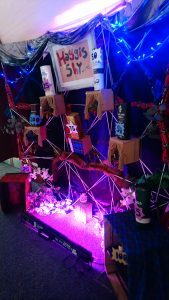 The brief from the client was they wanted a fun and interactive festival-like atmosphere to encourage delegate networking in an informal way. We hosted two spaces in the EICC for the conference which accommodated 750 delegates overall. 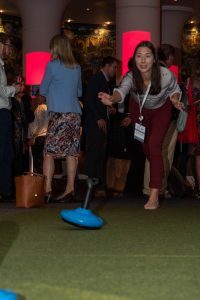 With people coming from all around the world, the client wanted to ensure that as well as being a networking event, delegates were able to enjoy a real Scottish experience. Pipe Major Roderick Deans greeted the delegates with a traditional Scottish bagpipe reception. This was a great way to introduce the guests to the Scottish theme of the evening. In the Strathblane Hall we had our 10-piece Tartanium band open the night with a 20-minute Scottish show. 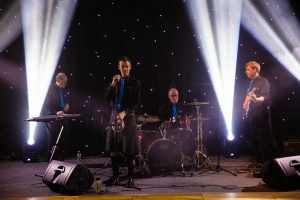 The Tartanium band mixes traditional and contemporary styles of Scottish music combining bagpipes with funked up basslines and incredible guitar solos. Adding to this spectacle, we had three Tartanium dancers perform a choreographed routine which combined traditional and contemporary steps to compliment the bands funky and cutting-edge sound. Guests were then invited onto the dancefloor where they were taught some easy ceilidh dancing moves. 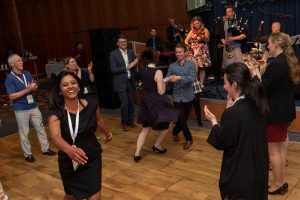 With a 10-piece ceilidh band our guests got a taste of what a full Scottish Ceilidh is like and, also danced to traditional dances including the Dashing White Sergeant, Strip the Willow and Canadian Barn Dance. Reel Time transformed the main foyer from a delegate registration area into various interactive Scottish experiences. Guests were given the opportunity to try indoor curling and a haggis shy . 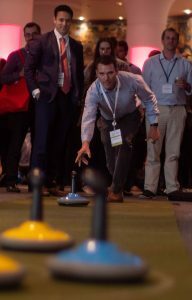 Indoor curling was a chance for the delegates to try something new and brought a competitive thrill to the evening. Guests were asked to slide their curling stones closest to the target on the mat for competing points. The haggis shy was a fun event involving throwing haggis like balls at targets to build up points. Guests got to meet the Heavy athletes that perform at Scotland’s Highland Games and speak to them about their sport. The athletes then let the guests try their hand at the indoor caber tossing experience. 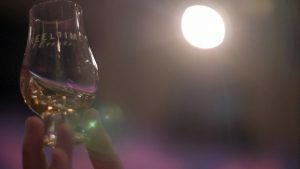 To wash down the fantastic food served at the EICC we put on a whisky vs gin tasting. This meant the guests could try some fine Scottish spirits whilst also learning about the distillation and production of Scotland’s drinks. One of our bars served two Scottish artisan gins representing one of the largest booms in the Scottish drinks industry. We chose to take Rock Rose and The Botanist to let guests taste a sweeter herbaceous and citrus gin against a more peppery, floral and earthier gin. These were served to guests neat and then as a perfect serve with tonic and our recommended garnish. The second bar for the whisky tasting was our cask bar we had taken and built in the venue. The bar featured two Scottish Single Malt Whiskies showcasing the regional differences that exist in the whisky world. We had Auchentoshan American Oak as one of the drams on offer which is from Auchentoshan distillery located just to the west of Glasgow. It is the only distillery in Scotland to triple distil every drop of whisky it produces, which gives rise to a light, sweet, grassy character. When this spirit is matured in American ex-bourbon casks the resulting whisky is creamy, with vanilla and lemon notes and a striking oaky spice. We chose to contrast this with a peaty whisky from Islay, Laphroaig. Laphroaig is one of just seven distilleries in Scotland which still malts its own barley and it is this age-old production method which is said to give the whisky the unique medicinal, iodine-like aroma and flavour, alongside the unmistakable smokiness. The event was a great success and the clients were thrilled with the whole experience. In a matter of hours the guests were able to experience traditional Scottish sport, music, culture and drinks all under one roof. The format of the evening, and activities provided, allowed the guests to interact and take part as they wished whilst giving them the freedom to network and engage with each other. For more information on the Scottish activities that we provide for conferences, please see our conference page on the website or get in touch with the Reel Time Team for more inspiration.